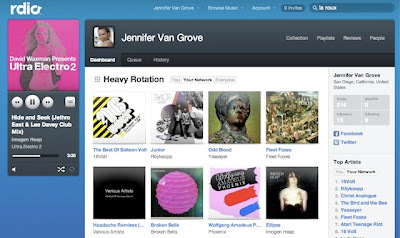 Music-streaming service Rdio only launched in the UK in May, yet it has already been completely redesigned, with a new drag-and-drop organizer and more accurate music recommendations. Rdio's biggest rival is Spotify, a service we use regularly. It would take a lot for us to switch our subscription, but Rdio could be the service to make us do so. That's because, while both services have over 15 million tracks, unlimited streaming, advert-free options for £4.99 a month and use Last.fm 'scrabbling', we think Rdio looks better and is easier to use. For example, collections, playlists and syncing options can be changed with one click. Also, you don't have to download Rdio's software to use the service, like you do with Spotify, because it's available in your browser. But if you do download it, you'll notice it launches in a fraction of the time, and is easier to close than Spotify. Its search is faster, too. If a track isn't available in Rdio, you can still add it to your collection and it will play when it's added to the music library. In Spotify, if a track isn't available, it doesn't even appear in the search, so you can't stay updated. Rdio isn't perfect, of course. Its phone app, when we used it, was slow when skipping tracks, and there aren't any web apps, whereas Spotify has several, including Pitchfork and Soundrop. Plus, Rdio doesn't offer any free services at all. If you're willing to pay for unlimited streaming, mobile access and no adverts - and we think it is worth doing so - then Rdio is a very credible alternative to Spotify. However, if you use Spotify Free, Rdio offers nothing but a seven-day trial and is unlikely to tempt you away.